With fall peaking its crisp, pumpkin-spiced head just around the corner, yes, you can expect that the gloriously cozy hipster fashion will soon follow. So come on, get dressed in fuzzy infinity scarves holding warm lattes underneath fingerless gloves, proving that us thrift store shopping hipsters know how to accessorize for the season. But wait up! 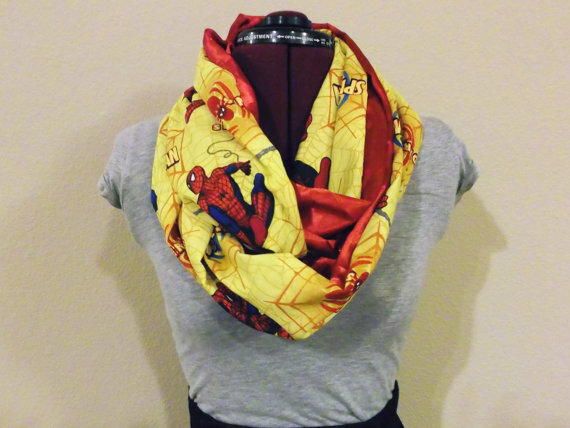 What if you're a Spidey fan that wants to get in on the fall fashion? 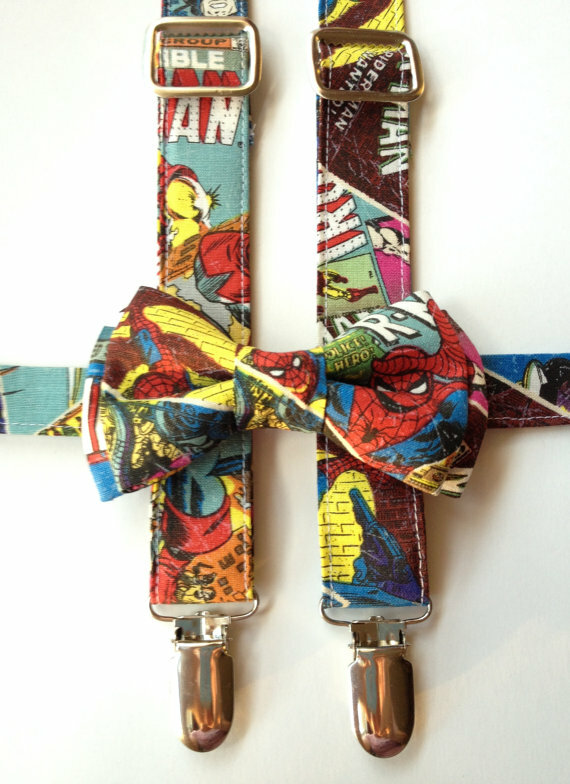 Well, we gotcha covered with amazing handmade and vintage finds for the comic nerd fashionista. Etsy shop Crazy Janes Customs hand makes fabulous Spiderman infinity scarves in classic red and yellow colors, perfect for an apple picking afternoon with the Hobgoblin. 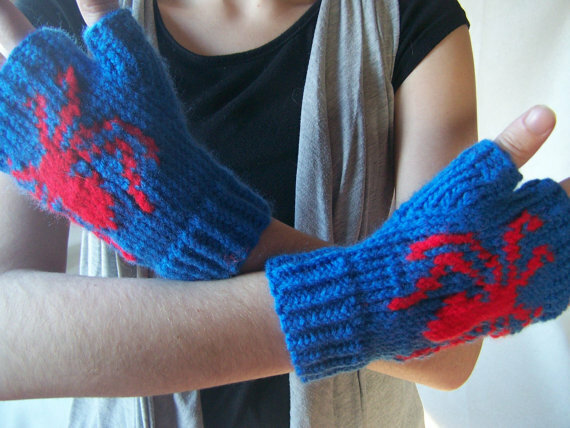 We can't have your fingers getting cold and stiff out in the autumn air, can we? 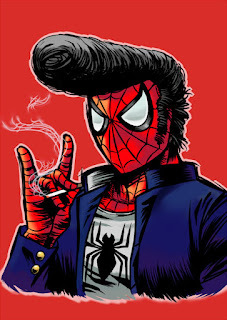 You need those for texting and slinging webs. 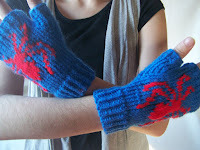 Frickin Epic makes these adorable crochet fingerless gloves perfect for keeping those digits cozy. Thrift stores are great for vintage clothes, and kitschetchic has got the perfect jacket. 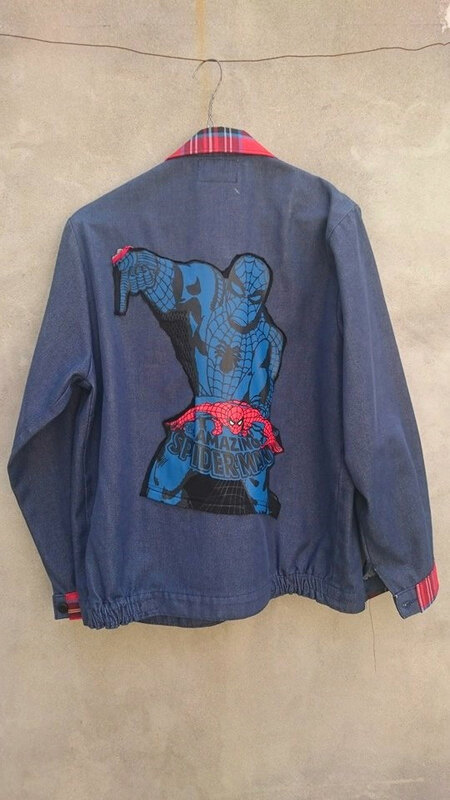 Check out this vintage jean jacket upcycled with flannel trim and an amazing Spiderman decal. Your hipster friends are gonna be so jelly they'll dissolve to sand. Of all our internet shopping finds, these red leather Spidey boots are the most fantastic -- and I don't mean four!!! 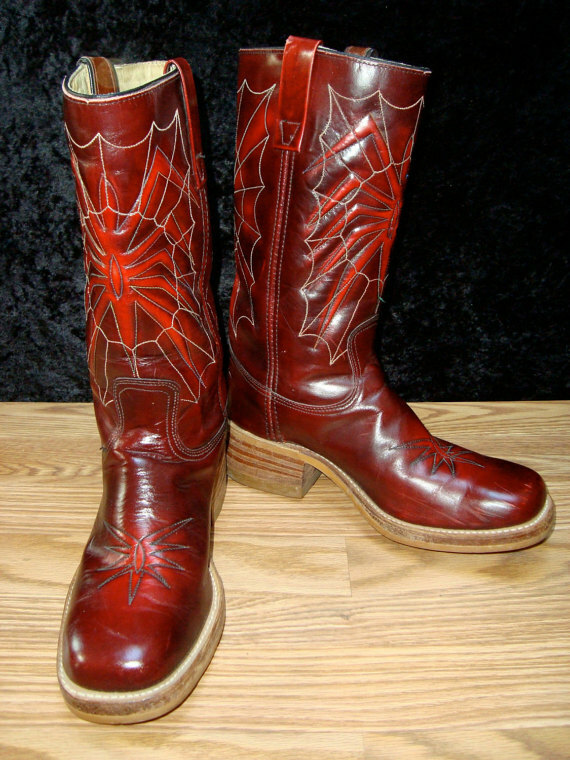 Faux Furr Vintage is selling these one of a kind boots featuring a near perfect Spiderman symbol accented with white web stitching. And trust me, nothing says autumn fashonista like a pair of leather boots. 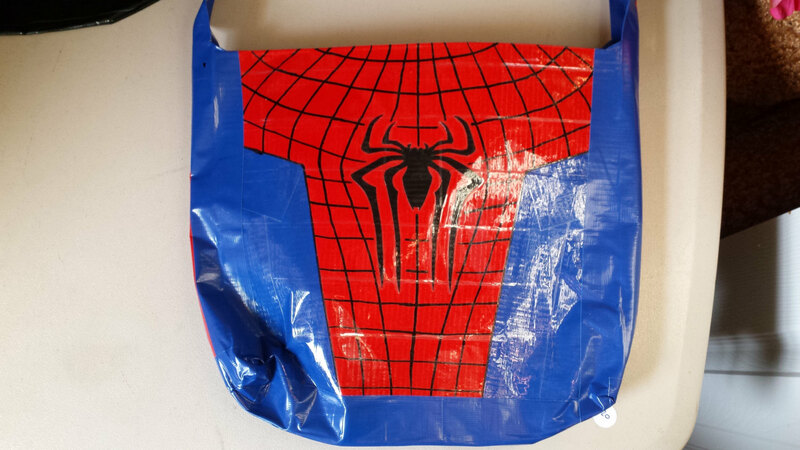 While you're out leaf peeping with the Black Cat, please keep in mind that this Spidey bag made from colored duct tape will totally complete your look. The meticulous taping skills of The Hollow Oak is beyond compare and the classic comic palette is protected by a layer of clear tape, so it can double as an umbrella. Of course, suspenders and bow ties are the very foundation of hipster fashion, and Time Lords of the English variety. 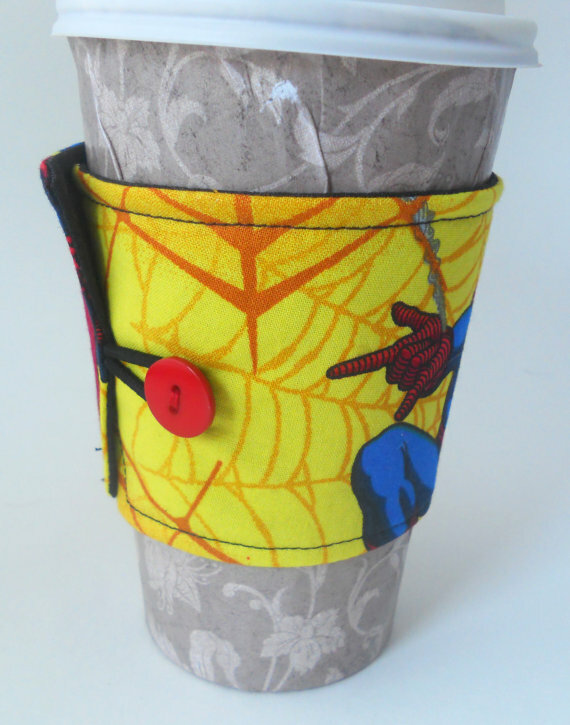 Bo Wagon makes this brilliant set with vintage Avengers fabric featuring The Amazing Spiderman. Pumpkin-spiced lattes is the number one drink among hipsters this season, so you'll need this web-slinging cozie handmade by Flower Child Cozies to keep your caffeine warm. And it totally matches the infinity scarf! Not that you should try and match at all, I think that might be against the Marvel rules. Keep your head and your face warm with this Spiderman beanie beard hat from Sue Stitch. 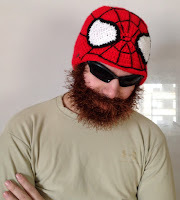 Even if you can grow your own, which I'm sure you can, wearing a crotchet beard on top of your regular beard makes you extra-super-hip and ready for all fall activities. 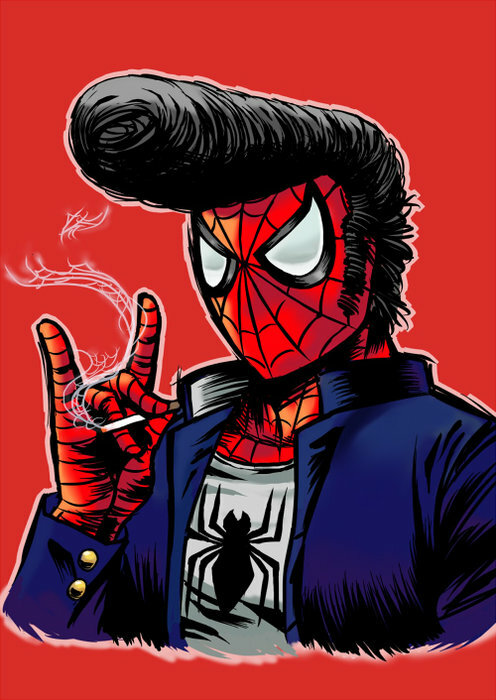 If this is too much work, you can always hop over to PureCostumes.com to purchase a ready-made spidey outfit. K. Rielly is an expert in all things pop culture and writes about female geek life. She’s married to a Sith, has an awesome minion in training, and is the proud property of an old cat. She is part of Pure Costumes Ideation Team and you can also follow her on Twitter.